محبی, نعمت الله, عزیزی, مجید, ضیائی, محسن, فائزی پور, محمد مهدی. (1394). مطالعه و ارزیابی جاذبه های اثرگذار بر کسب فرصت های حاصل از برون سپاری خارجی در صنعت مبلمان چوبی ایران. مجله صنایع چوب و کاغذ ایران, 6(2), 203-216. نعمت الله محبی; مجید عزیزی; محسن ضیائی; محمد مهدی فائزی پور. "مطالعه و ارزیابی جاذبه های اثرگذار بر کسب فرصت های حاصل از برون سپاری خارجی در صنعت مبلمان چوبی ایران". مجله صنایع چوب و کاغذ ایران, 6, 2, 1394, 203-216. محبی, نعمت الله, عزیزی, مجید, ضیائی, محسن, فائزی پور, محمد مهدی. (1394). 'مطالعه و ارزیابی جاذبه های اثرگذار بر کسب فرصت های حاصل از برون سپاری خارجی در صنعت مبلمان چوبی ایران', مجله صنایع چوب و کاغذ ایران, 6(2), pp. 203-216. محبی, نعمت الله, عزیزی, مجید, ضیائی, محسن, فائزی پور, محمد مهدی. مطالعه و ارزیابی جاذبه های اثرگذار بر کسب فرصت های حاصل از برون سپاری خارجی در صنعت مبلمان چوبی ایران. مجله صنایع چوب و کاغذ ایران, 1394; 6(2): 203-216. امروزه بسیاری از کشورهای در حال توسعه به‌دنبال استفاده از فرصت‌های برون‌سپاری کشورهای پیشرفته می‌باشند، چرا که تحقق این امر مزایای فراوانی برای آنان به دنبال خواهد داشت. در همین راستا، تحقیق حاضر با هدف شناسایی و رتبه بندی جاذبه‌های تاثیرگذار بر کسب منافع حاصل از برون‌سپاری خارجی در صنعت مبلمان چوبی ایران، با استفاده از رویکرد غیرپارامتریک تجزیه و تحلیل سلسله مراتبی ای‌اچ‌پی به‌عنوان یکی از معتبر‌ترین روش‌های تصمیم‌گیری چند معیاره، اجرا شده است. برای این منظور در مرحله نخست، پس از مطالعات تطبیقی و همچنین انجام مصاحبه با کارشناسان داخلی و خارجی، معیار‌های تاثیرگذار شناسایی، گروه‌بندی و در نهایت درخت تصمیم‌گیری مسئله ترسیم گردید. در گام بعد، داده‌های مورد نیاز جهت اولویت‌بندی معیار‌ها در قالب پرسشنامه‌‌ استاندارد و بر مبنای مقایسات زوجی جمع‌آوری و در نهایت مراحل محاسباتی آن در نرم‌افزار اکسپرت‌چویس انجام شد. نتایج نشان می‌دهد که زیرمعیار‌های "برخورداری از مزیت نرخ برابری ارز"، "ثبات اقتصادی در کشور مقصد"، "نرخ تورم"، "هزینه دستمزد نیروی انسانی"،"هزینه تامین مواد اولیه"،" کیفیت زیرساخت‌های نرم‌افزاری و سخت‌افزاری تکنولوژیک در صنعت مبلمان"، کیفیت و مهارت نیروی کار و صنایع جانبی و بالادستی توسعه یافته به‌ترتیب در زمره مهم‌ترین معیار‌های اثرگذار بر کسب فرصت‌های برون‌سپاری در صنعت مبلمان چوبی ایران به‌ شمار می‌آیند. Greaver, M.F., 1999. Strategic Outsourcing, A Structured Approach to Outsourcing Decisions and Initiatives. American Management Association Business publication, 344 P.
 Razmi, J., 2008. Lean Approach for Lean Production, Tehran University Press, Iran, 250 P.
 Shafiee Ardestani, M., 2001. Factoryless Production in Manufacturing Sector (Consept, Basic & Cases), Tehran Press, Iran, 282 P.
 Masoumi, M., ShahMohammadi, F. and Feizabadi, B., 2003. Strategic Outsourcing, Industrial Management Organization. 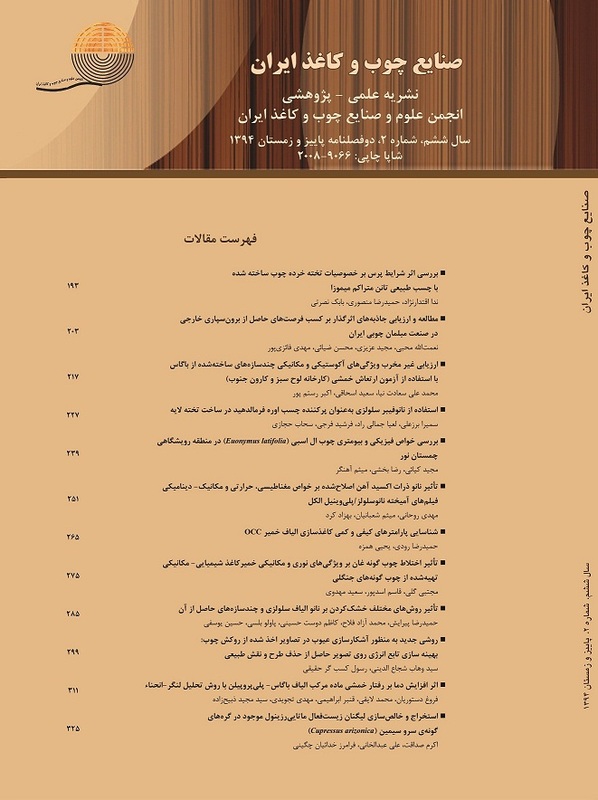 The First National Conference on Outsourcing, 5Aban,Tehran, pp: 40-48. The IMD World Competitiveness Year Book., 2013. International Institute for Management Development, Lausanne, Switzerland, 566 P, Retrieved from: http://www.imd.org/wcc. Gilley, K.M., and Rasheed, A., 2000. Making More by Doing Less: An Analysis of Outsourcing and its Effects on Firm Performance. Journal of Management, 26(4):763-790. Power, M.J., Desouza, K.C., and Bonifazi, C., 2004. The Ten Outsourcing Traps to Avoide, Journal of Business Strategy, 25(2):37-42. Ziaei, M., 2012. Factoryless production: The Effective Strategy for Development of Iran Furniture Industry. Iran Wood & Paper Ind. Journal,7(9):68-72. Li, Y., Liu, Y., Li, M. and Wu, H., 2008. Transformational Offshore Outsourcing: Empirical evidence from Alliances in China .Journal of Operations Management, 26(7):257-274. Tayebi, S.K.. and Zamani, Z., 2009. International Outsourcing, Human Capital Development and Economic Growth in Asia- Pacific Countries. Journal of Education and Development, 16(29):1-20. Hunter, S.L., Schuler, A., Gan, L. and Wan, Z., 2008. The Real Costs of Outsourcing from Low-Wage Countries: An Empirical Study of the Mississippi Wood Furniture Industry. Forest and Wildlife Research Center, Research Bulletin FP464, Mississippi State University. 16 pp. Ellram, L.M., Tate, W.L. and Billington, C., 2008. Offshore Outsourcing of Professional Services: A Transaction Cost Economics Perspective. Journal of Operations Management, 26(2):148-163. Tewari, M. and Hill, H., 2004. Outsourcing in North Carolina’s Furniture Industry, Retrieved from: Offshoreoutsourcingservice.com. Faraji, M. and Talkhestani, y., 2008. Studying the Iran Atractivities of World Outsourcing Resources. Journal of New Economy and Commerce, 4(14):88-110. Kotlarsky, J. and Oshri, I., 2008. Country attractiveness for offshoring & offshore outsourcing, additional consideration. Journal of Information Technology, 23(1):228-231. Dehondt, G. and Knapp, D., 2008. Affshore systems development: Factors affecting success. The journal of Cost Management, 22(1):36-46. Gazo, R. and Quesada, H.J., 2005. A review of competitive strategies of furniture manufacturers. Forest Products Journal, 55(10):4-12. A.T. Kearney Global Services locations Index., 2014. A Wealth of Choices: From Anywhere on Earth to No Location at All, 14 P. Retrieved from: www. www.atkearney.com. Outsourcing to Russia., 2011. Retrieved from www.outsourcingrussia.com. Banga, R., 2003. Impact of Government Policies and Investment Agreements on FDI Inflows, Indian Ouncil for Research on International Economic Relations. Working Paper, 116(3):63-70. Shakeri, A. and Salimi, F., 2008. Identification and Ranking the Effective Criteria on Chabahar Investment by AHP Method.Journal of Economic Research, 8(20):95-129. Kazemi, A., Beik, M., Hadian, E. and Hakimi, F., 2014. Identification and Ranking the Effective Criteria on Foreign Direct Investment by TOPSIS Method. Quarterly Journal of Fiscal and Economic Policies.1(4):42-72. Saaty, T.L., 2000. Decision making for leaders, RWS Press, Pittsburgh, PA, 323 p.
 Gail, F. and Lockwood, J., 2010. Globalization, Communication and the Workplace, Bloomsbury Publishing, USA, 288 P.
 Ratnasingam, J., 1999. Furniture Costing in Perspective, Putra University Press, Malaysia, pp: 54 – 63. Noble, D.F., 2011. Forces of Production: A Social History of Industrial Automation, Transaction Publishers, USA, 427 P.
 J.Francis, R., 1991. Numerical Control: Making a New Technology, Oxford University Press (Oxford Series on Advanced Manufacturing), UK, 240 P.